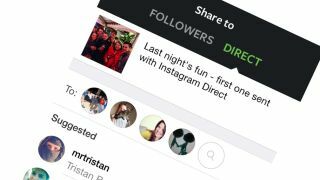 Instagram has announced its own direct messaging service called Instagram Direct. The new private messaging platform was the widely expected announcement at the Facebook-owned company's New York event earlier today. In introducing Instagram Direct, co-founder and CEO Kevin Systrom noted that communication and photography aren't disparate entities. The company launched, he recalled, with the idea to create a new way to communicate, but along the way Instagram became better known for photography than conversing. That changes with Instagram Direct; now, people can send photos and videos to each other privately while also carrying on a conversation via text. There are moments, Instagram effused, that we only want to share with certain people, and that's where Direct fits in. In a demo, Systrom showed how one user could send a picture to another, then send and receive text notifications in an ongoing conversation. The conversation can be revisited overtime instead of disappearing into the ether, something Systrom seemed quite keen on and almost certainly a swipe at SnapChat. Now when users open the Instagram app, they'll see a new Direct icon in the top right corner of their home feed. Tapping on the icon will open an inbox where photos and videos sent by others are kept under for-your-eyes-only lock and key. To flip the switch and send a video or picture, users tap the camera button, entering Instagram's normal photo and video capture and edit screens. When it's time to share, users will have the option of either blasting the item to all of their Followers or sending it Direct to specific people. When going Direct, users tap the names of the people they'd like to include on the message (up to 15), enter a caption and hit "send." From there, senders can see who's viewed the photo or video, who's liked it and watch and participate as a conversation takes off. Only photos and videos from people you follow will appear right away, but Systrom said people you don't know can send you messages, too. However, they'll be listed as pending requests, and users have the option to acknowledge or ignore the message. The service doesn't work without a photo or video - users can't simply send a text-based gram to one another without an image setting off the conversation. Instagram Direct is available today on iOS and Android, and it sounds like Instagram on Windows Phone users won't have access to Direct as the platform's app is still in beta. The company confirmed to TechRadar that Direct is mobile only. Don't forget about Spotify's latest free announcement.